Available In 4 Different Colors And With An Affordable Price Tag, There Is No Reason Everyone Home In America Should Not Have One. 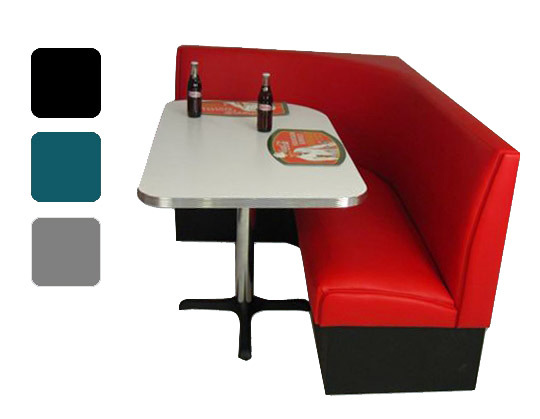 Our Americo L Diner Booth set has been seen over the years in this setting and I bet many of you have also enjoyed a milkshake or burger at a set like this in an “old fashioned” drug store or eatery in your home town. At this quality, you won’t find it cheaper! And here’s the best part…all made in the USA! All of our clients have a dream or vision. We feel it is our job to help make their dreams come true. Coupled with our fabulous product line, we also render design assistance as we guide the customer through the project, from beginning to end. Over the years we have garnered a great collection of these photos and are proud to be able to share some of them with you. Given the volume of photos submitted to us and our space considerations, we can’t publish them all! But, we provide a vast array of images that will get your design juices flowing! The sheer volume of customer photos we have collected is so large that we have broken them down into a few distinct categories. Residential Customers, Commercial Customers, and written testimonials. Prepare to be amazed at the talent and the generosity of our customers who have shared these intimate photos of their home. Enjoy! Please note, Hidden Storage Feature is not available on our Americo Series.